Through a Lens Darkly (21): Chinese Archery’s Troubled Republic Era Revival. Two archers somewhere in Northern China during the 1930s. Source: Author’s Personal Collection. Given the current growth of interest in all types of archery, it is not hard to understand the explosion of interest in Late Imperial Chinese bows and techniques. During both the Ming and Qing periods China was renowned for both the quality of its weapons and its dedication to archery training. Long after it had become clear that rifles would be the dominant force in the battlefield, the Imperial military examination system still mandated that individuals wishing to earn a commission had to demonstrate a high level of proficiency in both mounted and standing archery. The real question facing students of Chinese martial studies today is how such a vital, and culturally important, set of practices could completely vanish in the first place? I do not think that it would be much of an exaggeration to say that military archery constituted something of a national industry in China as late as the second half of the 19th century. The number of individuals seeking social advancement through the examination process was staggering, and each of these applicants required archery equipment, instruction, printed manuals, special training in horsemanship and accommodations as they traveled to various regional capitals to participate in these exams. An entire cadre of bowyers, instructors and authors was kept gainfully employed for generations in the service of these aspiring students. Nor was the idea of archery confined simply to the military. Confucian writings on the subject insured that both thinkers and scholars were well aware of the deep ties between Chinese culture and archery. Proficiency in archery even remained something of a status symbol. In Guangdong the leaders of gentry financed militia units would advertise their status by carrying a bow into the field (as opposed to a spear or a rifle) up through the middle of the 19th century. Then it was all gone. At the outset this appears to be a straightforward story revolving around technical progress. Few of these examination students studied archery out of a pure love for the pursuit. This was seen as a “practical” skill that could lead to career advancement. After Emperor Guang Xu abolished the military examination system in 1901 the industry supporting military archery training appears to have evaporated. Authors, craftsmen and martial artists moved on to other fields. The social dislocation following the 1911 revolution and the May 4th reform movement hastened this demise. Still, traditional archery was not forgotten all at once. A few individuals attempted to promote a revival of interest in these practiced during the 1920s and 1930s. These efforts appear to have been relatively small in scale and a reflection of the general increase of interest in the martial arts which these decades witnessed. Unfortunately the bow was never able to regain its luster. Following the further social disruption of the Japanese invasion (1938-1945) and the Communist victory in 1949, traditional archery vanished from public consciousness. In only two generations a martial tradition that had survived for thousands of years was almost totally forgotten. This chain of historical events might be accepted as a convincing account except for the existence of Japan. Japanese warriors also had a long and successful tradition of battlefield archery. This transmission was also threatened by the advent of firearms in the 17th century. In fact, the skillful adoption of firearms played an important role in the civil war leading up to the establishment of the Tokugawa Shogunate. Japanese masters and teachers of archery lacked some of the structural advantages that their Chinese brethren enjoyed. While the official character of the Chinese state was a bureaucratic meritocracy, the situation in Japan was more complicated. That country was ruled by a feudal government which had closed the class system and encouraged the Samurai class to transition into a group of bureaucratic administrators. Martial practices continued to be important in terms of group identity, even as the country enjoyed an unprecedented period of peace and stability. But not all practices proved to be equally popular. It was during the Tokugawa period that the sword became the “Soul of the Samurai” while the spear and bow (two weapons which had previously enjoyed preeminence on the battlefield) receded into the background. The Chinese embraced limited class mobility – at least in theory. The civil and military examination systems were created specifically to allow individuals from humble backgrounds to move into the ranks of leadership. How often this really happened is another matter altogether. Still, the mere possibility of mobility and employment meant huge numbers of civilians had an incentive to invest themselves in archery in China. The rigid class structure in Japan made this a moot point. So why didn’t traditional Japanese archery vanish along with the feudal system that supported it? This is an interesting and complex problem. I hope to be able to look at this question in a more detailed way in the future as I think it suggests some very important insights into the ways that the martial arts have been “remembered” and “forgotten” across Asia more generally. A full discussion of that topic will have to wait for another day. The short answer to the question is this: following the institution of the Meiji government in the second half of the 19th century the traditional Japanese class structure was dissolved. Samurai families were no longer granted the same privileges that they had enjoyed in the past. During this period of rapid reform and westernization the martial arts fell out of favor. Many smaller schools disappeared or lost their traditional benefactors. This process had a profound impact on the various Japanese schools of archery. As previous Samurai families turned away from Budo, an entire class of masters and instructors found themselves to be unemployed. What happened next is fascinating, though it generally gets skimmed over pretty fast in the histories of Kyudo which I have been able to consult. A number of these instructors went out and founded public schools open to individuals from any background. Fortunately many common people were interested in taking up archery. The historical literature tends to denigrate this period. The approach of these students seems to be remembered as “rustic.” They were more concerned with hitting the target (and betting on outcomes) than pure technique. Still, this groundswell of popular enthusiasm was what allowed the various approaches of archery to survive and to begin to rebuild themselves in the modern era. It was precisely this transition from one social framework to another, supported by market structures and genuine popular demand, which allowed for the creation of the modern schools of Kyudo that we see today. In China this same mechanism is conspicuously absent. On the surface it would appear that late 19th century Chinese archery was a robust industry supported by strong market forces. But its subsequent collapse after 1901 strongly suggests that this was not actually the case. Instead the Imperial government was in effect subsidizing the industry by forcing large numbers of individuals to invest in it in hopes of gaining some sort of future advancement. Whatever genuine interest still existed in the late 19th century was simply not enough to prop the archery industry up once these subsidies were withdrawn. Not everyone in China was content to see traditional methods of archery instruction disappear. I can find little evidence of systematic attempts to preserve these practices between 1901 and 1911. But after that things began to change. A number of institutions dedicated to the preservation of the traditional Chinese martial arts took an interest in the plight of archery. Perhaps the best known of these was the Jingwu (Pure Martial) Association, formed in Shanghai in 1910. Dedicated to “saving the nation” through the dual spread of its reformed martial arts and a certain brand of Chinese nationalism, the Jingwu association was the first organization to establish a meaningful presence across the length of China and even much of the South East Asian diaspora. This broad geographic base of support gave them an ideal platform to promote both their ideas about the value of China’s indigenous physical culture as well as their modernizing mission. In many ways archery was an ideal activity for the Jingwu Association as it bridged these two domains. While a traditional military skill it was also mentioned in Chinese classics. It was the traditional activity of both the gentleman and the warrior. In their publication on Jingwu (2010) Kennedy and Guo include a couple of intriguing pictures. One shows a member engaging in target practice on the large outdoor range set up behind the Shanghai headquarters of the organization. This individual appears to be employing a traditional stance and the thumb draw. Two Chinese Archery Champions in 1933. Source: Photo reprinted in Morris (2004). Originally published in Qingdao shi tiyu xiejinhui, eds., Liang zhounian gongzou zongbaogao. Jingwu’s efforts were valuable, but it seems reasonably certain that archery did not receive the same level of institutional support as its reformed boxing method. Other local and regional organizations also took an interest in traditional archery in the 1920s and 1930s. 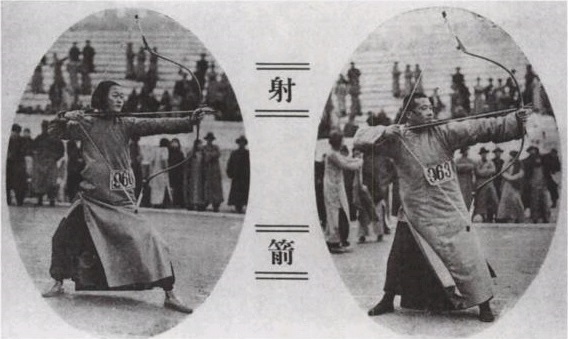 While Andrew Morris’ comprehensive review of sports in the Republic of China has little to say on the topic of archery, it does include an intriguing picture showing both the male and female champions of the “1933 Qingdao Municipal Archery Competition.” Both of these competitors are using traditional composite bows, but the photos seem to suggest that both are also using the western style of gripping the arrow. Stephen Selby’s discussion of Republic period archery is also brief, but it includes some valuable evidence on the various efforts to preserve these arts. He notes for instance that in the middle of the 1920s the Martial Arts Association of Chengdu established an organization called the “Archery for Virtue Club.” This new group enjoyed some limited success in promoting traditional shooting methods locally. It even created enough interest that in 1925 a local bowyer reopened a shop which had been previously closed to satisfy demand for traditional bows. The KMT backed Central Guoshu Institute also promoted some limited measures aimed at the revival of archery. Its plans for youth training in local schools made archery part of the rotation of activities that students would be exposed to. Unfortunately it is not clear whether this was western or Chinese style archery. Nor is it clear that the intensity of instruction was any different from what other children might have received in a Boy or Girl Scout camp. Tang Hao, the founding father of the academic study of the Chinese martial arts, also made a serious contribution to this effort. While not generally remembered as an archery student, in 1940 he published an edited collection of manuals titled Series on Qing Era Archery. This volume was released by the Shanghai City Martial Arts Advancement Association. The author’s penchant for practicality, as well as the general Guoshu philosophy of the period, seems to have colored the way in which these antique manuals were presented. Selby reports that Tang Hao attempted to frame traditional archery practice as a cost-cutting program for the Chinese military. Noting the many structural similarities between shooting a bow and a rifle, he suggested that adopting archery as a form of target practice would eliminate the “waste” of valuable ammunition. Unsurprisingly the various military institutions of the time showed little interest in the idea. The Japanese occupation of China, followed by the Chinese Civil War, put an end to most of these activities. Indeed, they severely threatened the survival of all sorts of traditional martial methods. What little activity remained did not survive the Communist government’s post-1949 campaign against the nation’s feudal past. The ultimate failure of the various Republic era efforts to spark a renaissance in traditional archery is tragic. But was this outcome inevitable? Consider the following points. First is the question of who was leading this attempted renaissance. In Japan the creation of modern Kyudo was overseen by individuals who were dedicated to, and steeped in, the way of the bow. Archery was their career. It was something that they made immense sacrifices for. There seem to have been many fewer of these individuals in China. That is not to say that in the 1920s there weren’t lots of people who had studied, or even taught, traditional archery. There were. But paradoxically they do not seem to have been the ones leading the charge for its preservation. Instead a lot of these reforms seem to have come from other places inside the martial arts movement. Reformers in both the Jingwu and Guoshu movement seem to have felt that “something should be done” about archery, but it was never the primary focus of these organizations. The entire effort feels somewhat half-hearted. And to be more specific, the “half” that is missing seems to have been public demand. Jingwu promoted archery as form of physical strengthening, and Tang Hao saw in it a low cost alternative to military target practice, but few people seem to have been invested in the activity for its own sake? This brings us to the picture that at the top of this post. This photograph dates to the middle of the 1930s. 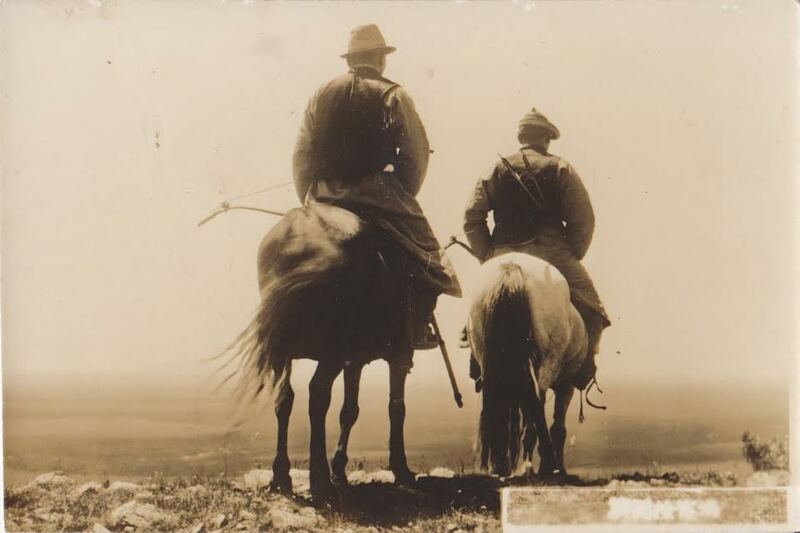 It was taken from the album of a Japanese soldier who was stationed in northern China during WWII. The image itself is not a snapshot. Instead it was taken by a professional photographer who resold copies of it to various tourists and soldier around town. Still, it looks pretty authentic. It shows two mounted hunters carrying traditional composite bows and arrows. Given that we do not actually know where this photo was taken it is hard to say anything with certainty, but it is probably safe to assume that the individuals in this photograph represent one of China’s various ethnic minority groups. That should remind us of something important. When we talk about the “disappearance” of traditional Chinese archery, we are subconsciously discussing something much more specific. We are actually observing the ways in which the dominant, and increasingly modernized, Han population gave up the bow after the establishment of the Republic. But lots of other minority groups in China, from the far north to the south west, continued to practice archery with a great deal of enthusiasm. This suggests one possible avenue for future research. The lack of interest in archery among common people in China in comparison to Japan may have a lot to do with questions of identity, rather than simply the march of technological progress. Archery was essential to the myths, art and deep cultural histories of both of these states. In Japan it had become strongly associated with the feudal aristocracy. And while the Samurai class may have been formally done away with in the 19th century, its values and the memory of social prestige lived on. Practicing the martial arts in Japan (at least after the period of their immediate decline early in the Meiji) was generally seen as a positive and sophisticated activity. The situation was always very different in China. The public was ambivalent about the social value of the martial arts at the best of times. Further, archery had come to be a key symbol of the Imperial state. Mastering archery was the essential prerequisite for a successful military career. But this had always been an alien state overseen by a foreign tribe. After the explosion of a strong Chinese “national identity” following the 1911 revolution many practices and institutions which had been accepted were now simply unthinkable. The great example of this is the change in hair styles that accompanied the end of the foreign dynasty. But there are many other examples as well. Whereas one might have boasted about winning a position with the Green Standard Army in the 1820s, by the 1920s it was much more fashionable to wear one’s revolutionary and nationalist loyalties on your sleeve. Traditional Chinese archery had prospered for hundreds of years from its close association with the state. One wonders if this same set of mental association worked against it in the republic period? While some reformers attempted to preserve this aspect of China’s heritage, very few members of the public expressed much enthusiasm for the enterprise. The death of traditional archery may be another example of the complex relationship between the reform of the traditional martial arts and the promotion of the Chinese national identity in the early 20th century. If you enjoyed this you might also want to read: Through a Lens Darkly (16): Capturing the Chinese Martial Arts Before the Camera, 1750-1850.